Allen Lawrence, M.D. and Lisa Robyn Lawrence, Ph.D.
caused by or related to Stress. Almost all of these illnesses are preventable and many are fully reversible. illnesses caused or made worse by stress before they create injury and irreversible harm. before they cause permanent injury. versions from this site. They are the exact same book with the exact same information, just your choice of format. Illness and Its Causes Are A Mystery To Most People. .
♦ Are you sick and not getting the results you want from your doctor? ♦ Are you well and concerned that sometime in the future you might become ill? an Intelligent Act of the Body, the Lawrences look at the many illnesses caused by or made worse by stress. What Can I Learn From Stress-Related Disorders, Illness and Intelligent Act of the Body? 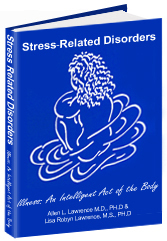 √ Learn how stress causes illness. √ Find out how your illnesses can progress from mild symptoms to disease and even to chronic disease. √ Learn how you can stop this from happening, reverse and eliminate your illnesses. Buy this book for yourself or give it as a gift of good health to a friend or relative who suffers from Stress-Related Disorders. Click here to purchase your copy of Stress-Related Disorders, Illness and Intelligent Act of the Body in either soft cover or e-Book versions.